Ride-sharing apps like Uber and Grab have brought us much convenience, both in terms of getting a ride anywhere and also payment methods. With most of us linking our credit cards to our accounts, paying for a ride is effortless, and we can get that slight ‘kick’ from getting off the vehicle #likeaboss. 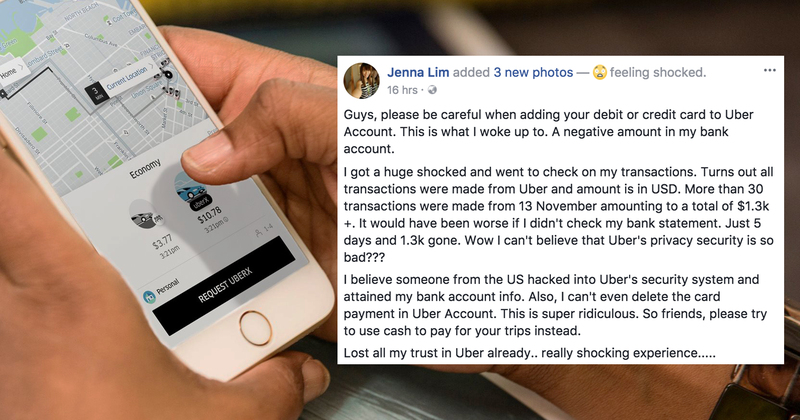 But this convenience also comes with the additional risk of having our details being compromised, and this was what Singaporean Uber user Jenna Lim experienced. 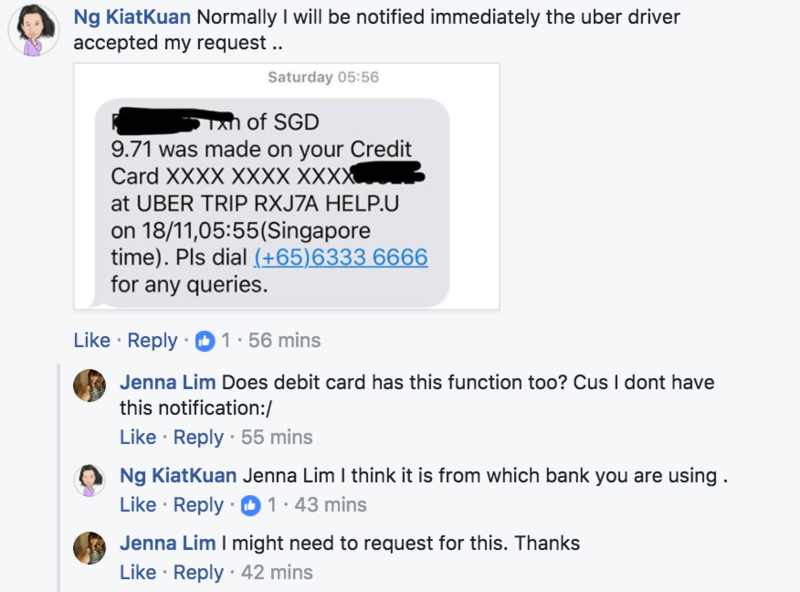 Guys, please be careful when adding your debit or credit card to Uber Account. This is what I woke up to. A negative amount in my bank account. I got a huge shocked and went to check on my transactions. 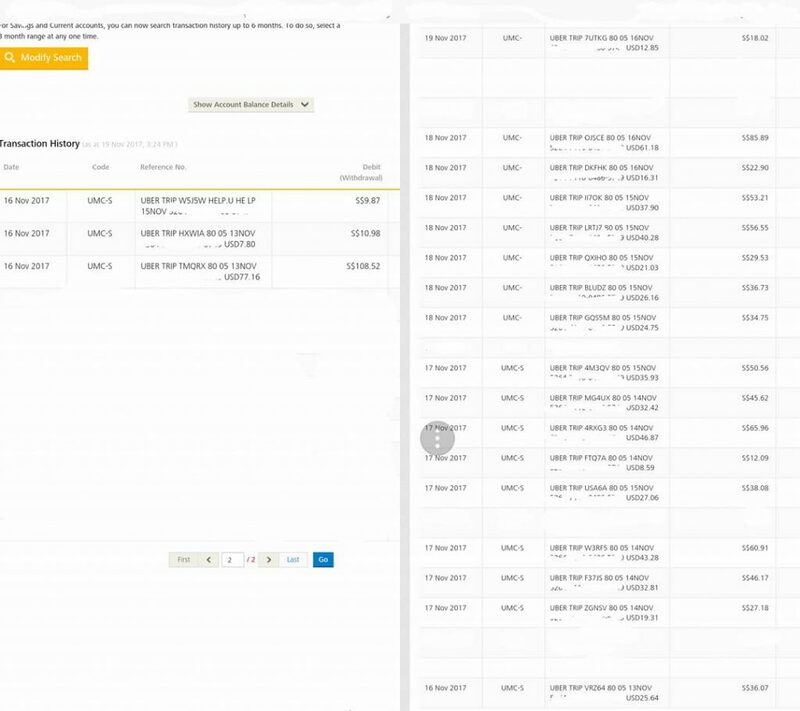 Turns out all transactions were made from Uber and amount is in USD. More than 30 transactions were made from 13 November amounting to a total of $1.3k +. It would have been worse if I didn’t check my bank statement. Just 5 days and 1.3k gone. Wow I can’t believe that Uber’s privacy security is so bad??? I believe someone from the US hacked into Uber’s security system and attained my bank account info. Also, I can’t even delete the card payment in Uber Account. This is super ridiculous. So friends, please try to use cash to pay for your trips instead. Lost all my trust in Uber already.. really shocking experience….. The screenshots accompanying the post reveal a slew of transactions being made in a span of 4 days (16 Nov – 19 Nov). What’s notable is that the transactions made were all in US dollars, and amounted up to almost S$700. The comments section on her post also revealed that she’s not the only one who’s had this nasty experience, as some also came out to share their own experiences. Why Were There No Notifications? With every trip taken with Uber, an email would be sent after the ride ends as a ‘log’ for the user. For Jenna, she didn’t receive any emails about these trips, which led her to come to the conclusion that it was only her bank account details that were compromised, and not her account. Another commenter also brought up that for her bank – we’re guessing CIMB based on the hotline in the screenshot – she gets an SMS notification whenever a trip (regardless of amount) is charged to her card. Asking around, I realised that a good number of my colleagues don’t get these SMS notifications from their bank or Uber, and only receive the email as ‘evidence’. Personally, I don’t receive SMS notifications about charges to my card after the trips either. And I’m not going to lie, but I immediately went to check my bank account for any suspicious activity after reading her post. Perhaps what we should be asking is not just why credit card theft like this seems to be happening rather frequently, but also why some are not getting notifications whenever their cards are charged. Regardless, if this story scared you, we suggest that you turn on notifications from the app and your bank ASAP. Our team is reviewing the incident and will address it accordingly. We would like to assure the public that payment information is encrypted when you enter it into the Uber app. However, there are myriad reasons why such incidents occur – including whether the user is maintaining good habits in safeguarding personal information security, whether the device has been compromised, or even issues with the financial institution and its products. If you believe your payment information has been stolen from another service and used on Uber, please contact your bank immediately. We will work with them to refund the charges. If you believe your Uber account has been compromised, you can reach our support team through the help section in the Uber app or at help.uber.com. We will help reset your password and refund unauthorised trips.